Great speaking to you earlier. William Shakespeare should be the biggest (and not too dark skin pls although he's indian) and maybe he's holding on to a quill and scroll and smiling at everyone. As for Julius Caesar, he will be in armour and holding on to a spear. Maybe you'll also like to recommend what's a good composition? The purpose of this drawing is for a the backdrop of a Dinner and Dance event. Our client will be getting their staff to restage the shakespeare classics in their own funny manners. 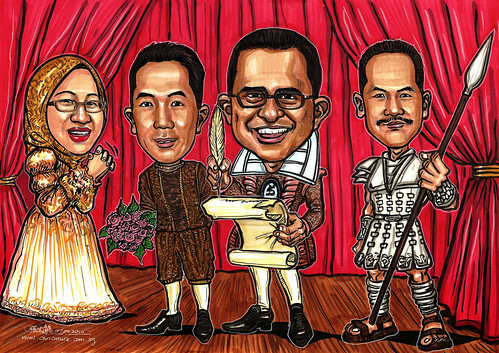 What our art director had in mind for the setting of the drawing is that the caricature characters will be on the stage, Hope that gives you enough information to start on your drawing." The client asked for a detailed pencil sketch preview, which they are willing to pay for a price for this. "Sorry but I think that the characters need to bear more resemblance to the pictures. Besides caesar, the other 3 characters look rather different. Will u be able to fine-tune it further? " 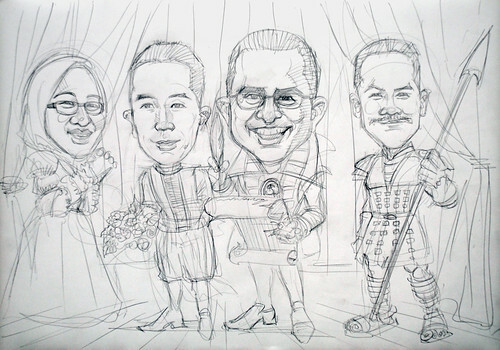 I think the caricatures looked like them. Need the inking and colouring to bring out the facial muscles and details. Thus, I asked for more and better photos, while waiting for their client's (NBT Borneo) feedback. Jit, this is a classic! You never cease to amaze me. Haha.... you cheered me up during my stress period! Thank you!